how to make sure you are painting on watercolour paper free of contaminants. 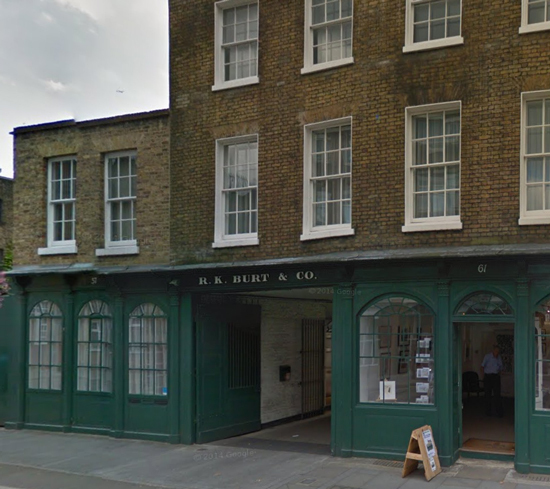 I had a very interesting talk on the telephone this afternoon with Clifford Burt, the Managing Director of RK Burt who told me how contamination is the most frequent reason why watercolour paper causes problems for a watercolour painter. It prompted me to do some more research and to write this blog post. One of the interesting conclusions from my research is that I found very little is said in watercolour instruction books about the importance of avoiding contamination of your paper - and some said precisely nothing! How can you contaminate watercolour paper? There are four main ways in which watercolour paper can become contaminated. YOU can accidentally or negligently contaminate a paper. This is the MOST FREQUENT source of contamination - often due to ignorance or thoughtlessness. How YOU handle a paper is really important. "more than 90% of all complaints from artists about sizing problems with watercolour papers are due to contamination"
It is ESSENTIAL that your hands and ALL the ways in which you process your paper are free from contaminants and in particular detergent. That's because paper is made of constituents which have chemical components that can react with other substances which you introduce. Detergent is the main source of contamination of watercolour paper. It reacts with the size and changes the surface of the paper and how the paper reacts to paint. • Detergents may have contaminated the paper, which attack the size. 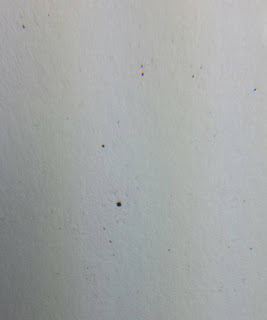 Microscopic amounts of detergent are enough to cause significant problems for a watercolour paper - in patches, spots or across the whole paper - depending on the source of detergents, as these can attack the size, causing the paper to become absorbent and unusable. When soaking the paper it is very important NOT to accidentally contaminate the paper with residue detergents found in areas like baths, kitchen sinks. These detergents attack the sizing causing the paper to become very absorbent and unusable. use a cup for your painting water which gets washed up with other items and dried using a tea towel which has previously dried items covered in detergent. If your water container acquires detergent it will transfer this to the water - and then to your paper. INSTEAD - have a container you only use for painting water. wash up but don't rinse your hands and/or dry them on a towel which will have had contact with detergent. INSTEAD use paper towels or a towel which doesn't come into contact with detergent. Sizing agents can be destroyed very easily by a wide range of chemicals include microscopic quantities of detergent, or even bright sunlight. cover your paper with photocopy or other paper which is not acid free. Other papers can introduce other chemicals on to your paper. INSTEAD use the same paper as a cover. Store your paper a long time before you use it - but don't protect it from environmental contamination. INSTEAD use a flat, clean, dry and environmentally stable environment for paper storage. There are a number of things you can do to minimise the chances of contamination - primarily by avoiding any contact with contaminants. CHECKLIST: How many of these do you do on a routine basis? Make sure your brushes are not the contaminant. Only use brushes which have been well rinsed after cleaning. Never protect the painting by covering your paper with anything you are not 100% certain contains nothing that can harm the paper. The best cover is always another piece of the same paper. However you also need to take care to keep cover paper away from potential contaminants otherwise it will become a vehicle for their transfer. Never use a tool on the paper which is not clean and/or checked to make sure it does not contain potential contaminants. The practices and performance of the retailer - and his staff - that sold you the paper is an important factor in painting on uncontaminated watercolour paper. Buying an unopened pack of 10 full sheets is the best way of circumventing the retailer problem. Beware of the pack of half or quarter sheets which have been assembled by the retailer. Repackaging the paper into smaller sheets offers scope for introducing contamination. The handling required to cut the paper and stack it and insert into a pack is considerable. Check how the paper has been labelled. One of the things you can do to help yourself is only buy paper which meets archival standards. Bearing in mind that the British Trade Standard definition for the paper trade of an uncoated woodfree and acid free paper can include 10% Thermo-Chemi-Mechanical Pulp and 1% lignin, it is clear that British Standards are not always what one might expect. The lignin produces acids as it degrades, thereby introducing a destructive force into the paper. 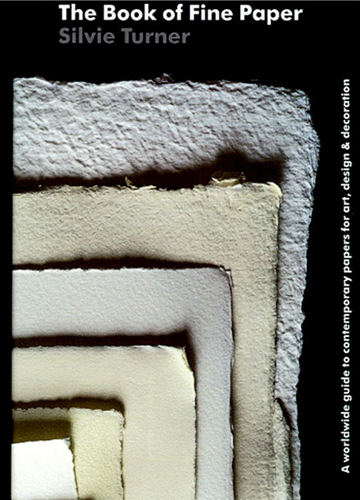 There are even some papers being sold for Artist use which include recycled fibre and are described as “acid free”. Clearly, even if a paper contains “best white waste”, it cannot be guaranteed not to contain any mechanical pulp, and the resulting lignin. R. K. Burt - ISO 9706: How long is long life? Manufacturers of watercolour paper can protect paper from the contaminants that can be found in the atmosphere and the paper-making process. It pays dividends to investigate exactly what a manufacturer does. Use Calcium Carbonate is a buffer to help a paper withstand the negative environmental effects of the natural acidity of the atmosphere. Interestingly even if this is done, a 100% cotton watercolour paper can still have contaminants in it which render it defective. 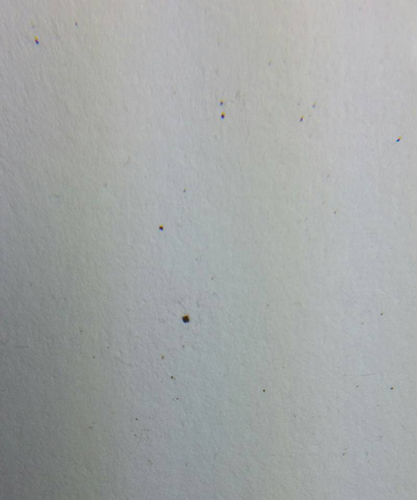 This is an image of a sheet of 300lb Hot Press Paper produced by a European manufacturer which has very pronounced black specs embedded in the paper. Presumably these have bypassed their quality controls. A paper such as this should ALWAYS be returned to the fine art paper retailer/wholesaler so they can investigate further. Problems cannot be identified and remedied if they are not reported. This has been reported in my new "Fine Art Paper Feedback Group" by more than one person - and again was another reasons for this blog post. There aren't enough books about watercolour paper! Thank you for this post Katherine, it really is a good balance to remind artists that the problems with watercolour paper are not always caused in the manufacturing process. I have always purchased paper in sealed packs for the reasons you describe, and am bewildered when I see how art shops sometimes display good quality paper on shelves that are open to the atmosphere and subject to extremes of temperature as well as humidity and dust. I use an Archival Cabinet in my studio, because this stores paper in a beautiful neutral and sealed system. In this I have stored both print making and watercolour paper from as far back as 1972, which is all in immaculate condition. A good storage system is expensive, but it will last a life time and is a very worthwhile investment. I wear archival gloves when moving paper from the cabinet to the easel. If I need to lean on the paper when drawing and painting, I have a piece of neutral paper placed between my hand and the paper that I am working on. Thanks again Katherine for bringing this to light. Many thanks for the helpful comment Coral. I'm greatly intrigued by the archival cabinet and am wondering where you got it. Re the Archive Cabinet - its a rather posh name for a museum quality plans chest. The one I have is made by the German company Otto Kind. I purchased it second-hand some years ago, from a conservator, and it remains in perfect condition. I'm told they are now very expensive to buy new, and can sometimes be found on eBay. There are quite a few companies in the UK that make this kind of cabinet.